Auto escape tool. 7 inch overall. Designed to help prevent automotive entrapment after an accident. 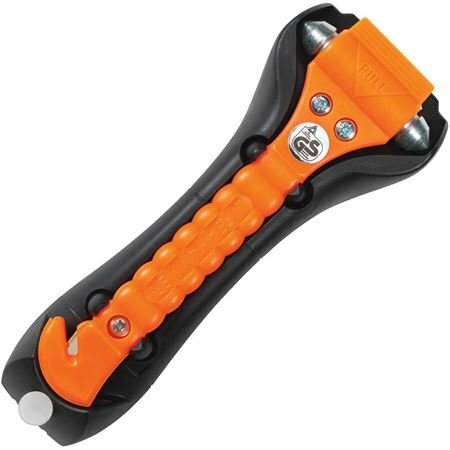 Should power locks become disabled or a safety belt jam after an accident, the double-sided steel spiked hammer heads allow the vehicle occupant to shatter side and rear windows, while a safely concealed razor-sharp blade cuts easily through seatbelts. Comes with black ABS mounting bracket to hold the tool in place within vehicle console until needed. Orange polypropylene glow in the dark handle with additional fluorescent button for easy retrieval. Boxed with hanging tab. If you have any questions about this product by LifeHammer, contact us by completing and submitting the form below. If you are looking for a specif part number, please include it with your message.